Refunds are a very important aspect of sales. If a customer is not satisfied by your product, (s)he has a right to ask for a refund. Therefore you need to know how to refund. In order to create a refund, store administrator needs to use Credit Memos. It’s a way to give your customers their money back. To create a refund, go to Sales -> Orders. From this list select an Order that you want to refund. Note that only complete (invoiced) purchases can be refunded. Press “View”. Then press “Credit Memo”. Now scroll down to find “Refund Totals”. Here you can see Refund Subtotal. You can also Refund Shipping by entering the price of shipping. If you want to give your customers more money back, you can enter a sum in Adjustment Refund. If you want to give them less money (for example, if your product has been damaged on purpose), then in “Adjustment Fee” enter the sum that you want to hold back. If you want to email a copy of Credit Memo to your customer, select the corresponding checkbox. Now you press “Refund Offline” and your refund is complete. You can also Submit a comment and Notify your customer after the refund is complete. If you want to make your comment visible on storefront, select the “Visible on Storefront” checkbox. Here you can view details of each refund and send emails to your customers and make your comment visible on Storefront. Where can a customer check the refund details? 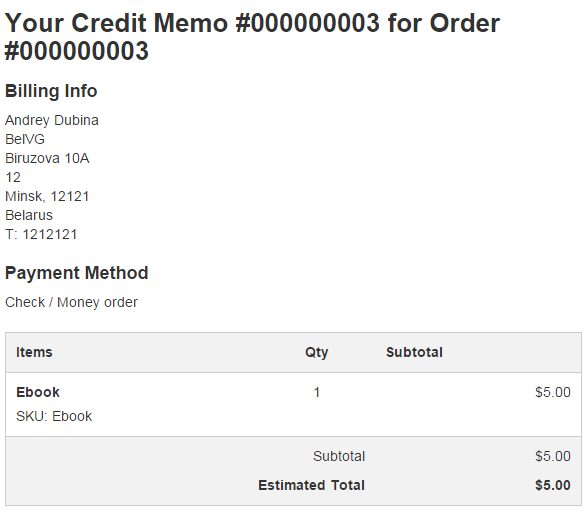 If you selected the “Email Copy to of Credit Memo”, then your customer will receive a message with Refund details. To check if their order has been refunded, a customer enters their account, goes to “My orders” and checks the status. If an order has been refunded, its status would be “Closed”. A customer needs to press “View” and here (s)he goes to Refunds to check their details. I want to know that how customer will use refunded money if he pay by cash on delivery and money order and other payment methods..
@gopal, in your case only offline refund will be available, so real money return should be done through the bank processing center. I want to know that after we create a credit memo to customer, Does he/she have the choice to use this credit points (or) money to their future purchases? and Does this credit details will be exists in their account details? And do we have any authority to create a deadline or expiry for utilizing those credit. @ajay, we are not talking about the points module in this article. Answer to your question depends on the solution you are using for the loyalty program on your website. I want to know how the customer use that credit when we give him offline mode.Does the credit goes to customer’s account for the future purchases.